In this episode of ‘Paris, Tokyo’, celebrated chef Dominique Bouchet talks about the love for Japan that he has harboured for several decades now. 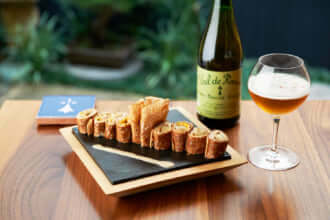 This high-level representative of French culinary heritage (having passed through the Crillon, Jamin and la Tour d’Argent) explains how he brings together French and Japanese cultures on a daily basis in his creations, mixing products and know-how from the two countries to bring out the best of both. The love story between Bouchet and Japan dates back to the 1980s. Back then, the prestigious restaurant La Tour d’Argent tasked him with opening a branch in Tokyo, under the guidance of Joël Robuchon. Almost 30 years of return trips between France and Japan followed, punctuated by decisive discoveries and encounters (indeed, Bouchet met his wife during this period). In 2013, the chef, drawing on a brilliant career in France, opened a new restaurant in his name…right in the heart of the Japanese capital, over 9,000 kilometres from the 8th arrondissement in Paris, the area he usedto occupy. 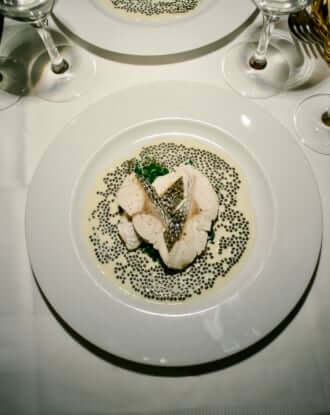 Since then, Bouchet has seenhis Tokyo restaurant receive two Michelin stars. 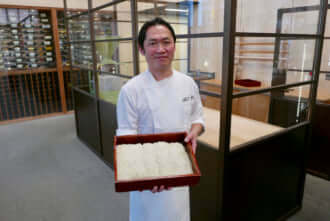 He hasalso opened two new restaurants in Japan: The bistrot Les Copains de Dominique Bouchet (also in Tokyo, in Ginza) and Le Grill Dominique Bouchet Kanazawa, a restaurant which specialises in grilled food, in the hugely historic city of Kanazawa.